Local businesses agree: It’s time to invest in Oregon. Business leaders know a good investment when they see one. That’s why more than 50 businesses and business leaders from Medford to the coast to Pendleton to Portland are lining up behind House Leadership’s Oregon Education Investment Initiative. Speaker Kotek and Chairs Nathanson and Barnhart’s plan would add back two weeks to the school year for K-12 students, increase access to early education, and lower tuition for community college and university students. Oregon businesses know it’s time for large corporations to finally do their part to support our schools and family services. Businesses and business leaders including Dave and Christine Vernier in Beaverton, Sweet Life Patisserie in Eugene, High Ridge Construction in Springfield, Motel Del Rogue in Grants Pass, Uppercut Barbershop in The Dalles and Beach Books in Seaside know that strong schools mean strong families and a strong economy. As business leaders from around the state, we applaud the Oregon Education Investment Initiative announced by Speaker Kotek and Chairs Nathanson and Barnhart. Their proposal to raise taxes on large corporations to make targeted and strategic investments in early childhood education, K-12 schools, and higher education is exactly the leadership that our state needs. Our businesses thrive when our communities have strong schools and essential services that families need. This is the first plan we’ve seen that makes serious investments by shifting the burden for investing in schools and services from small businesses and working families to large corporations. For decades, Oregon businesses across the state have been paying a higher rate in taxes than the large out-of-state businesses we compete with. The Oregon Education Investment Initiative will make our tax system more equitable by protecting Oregon taxpayers and requiring large corporations to pay their fair share in taxes. This revenue plan is what Oregonians have been waiting for. Our state will be able to make meaningful investments in job skills training, hire thousands of teachers to reduce class sizes, and increase college affordability, among other important strides. Oregon business owners proudly do our part to fund strong schools and services because we know that investing in our communities makes all Oregonians stronger. When our economy is healthy and families have to the opportunities and services they need, they can afford to shop at the tens of thousands of local businesses that make Oregon such a special place to live. Investing in education and critical services is the right thing to do because our businesses are only as successful as the communities we serve. 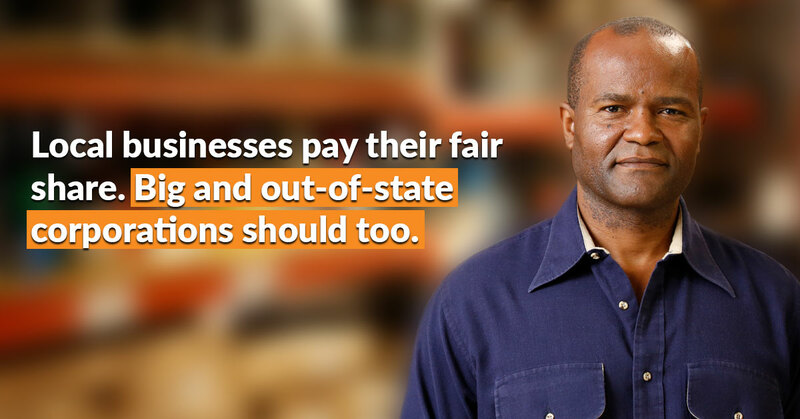 It’s time for large corporations to join us in paying our fair share to support the state we love. We are calling on the Legislature to do the right thing and raise revenue by taxing corporations this session.